Culture of the American Crow, Corvus brachyrhynchos. What we know about crow culture. The term culture, even when applied to human groups, is difficult to define. So many competing definitions have been espoused by Anthropologists, that it has become common to speak of culture in terms of its characteristics rather than selecting among the various possibilities. CULTURE is shared. All members of a particular group will share a common culture which defines the range of behavior "acceptable" within that group. CULTURE is learned. Culture is not inate or instinctive. It is passed from one generation to the next and from individual to individual. It may change over time, as new items are learned and become customs, and others fall into disuse. CULTURE is based on symbols. The elements of language are the primary symbols used by all groups which possess a culture. CULTURE is integrated. The culture of a group is not a collection of random characteristics. It is an interrelated whole. Although these characteristics were defined by Anthropologists - students of humans - they can also be useful as a framework for considering the "culture" of non-human species. When doing so, it should be remembered that when we speak of "the culture" of a species such as the American crow, we are, in all likelihood, speaking of a variety of cultures among the various crow populations, and that the culture of urban and rural populations of crows may well vary as much as might the human culture of Manhattan from that of a small town in Upper New York State. THE FIRST STEP in studying the culture of the American crow must be to determine if crows can learn new information, by observation and/or instruction, and if they can share this information with other members of their species. Many observers of crows have reported incidents which appear to support observational learning by crows and the application and sharing of this knowledge, but generally such information has remained in anecdotal form. One of the initial objects of the Crows.net Project will be to collect as many of these reports as possible, to determine under what circumstances crows learn, share, and utilize new information and method s of behavior. 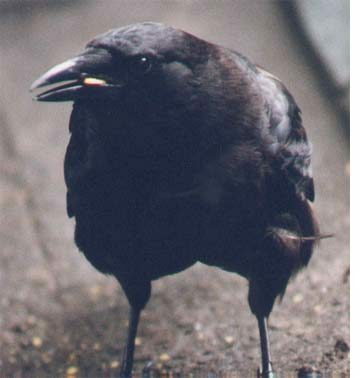 YOU CAN HELP in this initial study by reporting to Crows.net, via e-mail, your observations that support the hypothesis that crows are capable of learning new information and behaviors by direct observation of events in their environment. Please go to the How You Can Help page, where you can be directed to a form til fill out for your observations. These observations will then be posted on the Crows.net Project Crow Learning Page. You are at the Culture of American crows. Proceed to Language of American crows. © Copyright 1999-2010. Michael J. Westerfield. All Rights Reserved.